Friday is Dr. Joe Armstrong’s favourite day of the week. Not for the excitement of the approaching weekend, but because Friday is OR day in the Dentistry Surgical Care Unit (DSCU). Operating as an outpatient day-surgery unit, the DSCU enables the provision of oral surgery and a wide spectrum of dental procedures. 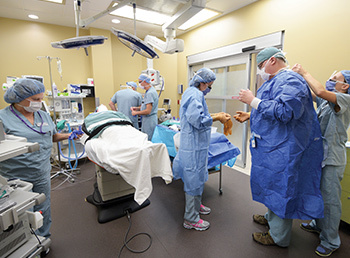 It features two state-of-the-art operating rooms, six recovery bays and a nursing station. The Unit is a freestanding operating facility – it does not exist within the walls of a hospital – which makes it unique among Canadian dental schools. The strong partnership is paying off – staff members are performing highly efficient procedures with low complication rates. The Unit also marked a significant milestone this past summer – 100 successful patient cases. Dr. Armstrong agrees, emphasizing a shared commitment to excellence. “Our approach is completely based around excellence in patient care and patient safety,” he said. The Unit is currently staffed by a team of nine, including dental surgeons, anesthesiologists, registered nurses, dental assistants and other allied health professionals. The DSCU currently accepts healthy adult patients, but will be phasing in paediatric cases in early 2017. At full capacity, it can accommodate up to 60 patients per week, and plans include extending care to geriatric and special needs patients. By expanding the scope of clinical care offered at Schulich Dentistry, the Unit is a key player in making specialty dental services more accessible in the London region. In addition to patient access, the DSCU will also enhance clinical learning experiences for Schulich Medicine & Dentistry students and residents. 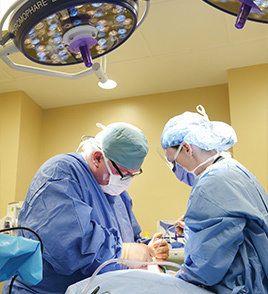 “The Unit provides an ideal interdisciplinary learning environment for students to learn minor surgical procedures, through observation and controlled teaching moments,” explained Dr. Armstrong. The combination of patient care, community impact and education is key to Schulich Dentistry’s future. “The goal is to be a top 10 dental school in North America, and the Unit’s successes will be a big contributor to that,” said Gough.